Being exquisite and magical has its price. The Lapis Lazuli has been one of the most used materials in jewelry for thousands of years and therefore, it is no coincidence that it has become one of the most counterfeit stones in the world. It’s not easy to tell the difference between fake lapis and the real gemstone. Each day the imitations are becoming better. So, how to tell if Lapis Lazuli is real? Top quality Lapis Lazuli is not cheap. When you find jewelry of lapis that you think is a bargain you better check it properly. Usually, a natural lapis lazuli necklace of good quality is above 40 USD. When the stone has too much white it means it’s classed as a cheaper calcite. If it has too much dark blue-gray it means it’s a cheaper Sodalite. Sodalite is a semi-precious stone. Its color varies from a pale blue-grey (common) to quite deep royal blue (rare). Sodalite does not reach the true ultramarine color of lapis. 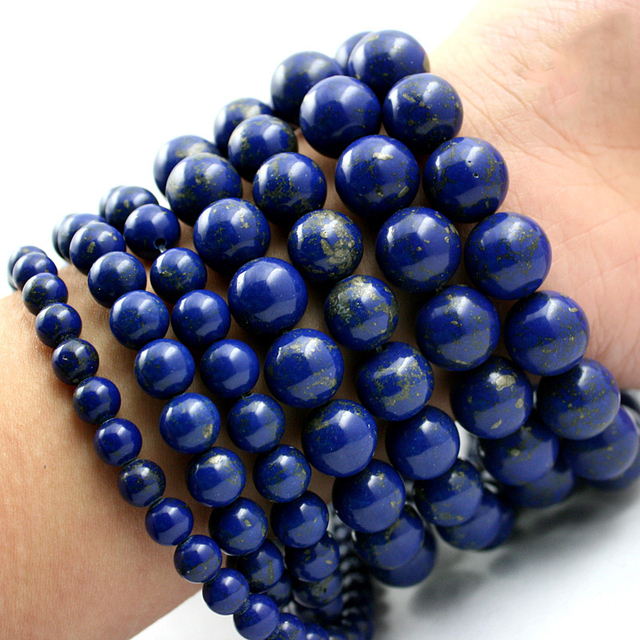 One of the components of Lapis Lazuli is Sodalite. Other kind of imitation is by dyeing the stone. Forgers also use similar stones or Lapis Lazuli of 3erd quality to dye it and make top quality imitation Lapis. To test if your lapis has been dyed wipe your stone with acetone or alcohol. If it looses its color it’s either a fake or a poor quality lapis. Taiwan is the top center for dyeing stones. Natural Lapis Lazuli will have a reaction to the Chelsea Filter. The Chelsea Filter is a dichromatic filter. It can only transmit light in 2 regions of the spectrum, deep red and yellow-green. Genuine Lapis Lazuli will react with a weak brownish red and the synthetic lapis will react with a bright red color. Natural lapis have silver or gold particles that shine which are seen inside the stone. This effect is real difficult to imitate and is a good indicator that it is real lapis. Nowadays some good quality fakes are showing this feature also. Although it usually ends up looking too uniform and too perfect for it to be real. Real Lapis Lazuli is around 5.5 on the MOHS Gemstone Hardness scale. So you have an idea of the hardness keep in mind that diamonds are 10 in the scale. Forgers also use a technique of reconstruction. They collect all the leftover bit of lazuli gemstone and they make a new stone or bead by grinding them and binding them together. It’s made of lapis so technically it’s not a fake but it’s not the true thing either. This lapis stone has an unnatural pebble dash feel and look to it. They are made from a small piece of a desirable, genuine stone that’s combined with an inexpensive or imitation gemstone to make the real thing appear larger or to enhance its appearance. Opal jewelry is often with composites. Doublets are composite stones made with a large, inexpensive chunk of material, sometimes an inexpensive mineral, that’s topped by a thin slice of the gemstone it’s meant to represent. The division usually isn’t obvious until you look at the piece under a loupe. One type of doublet is assembled by sandwiching a colored bonding agent between two clear, inexpensive stones-the added hue makes it look like a colored gemstone. Triplets are composites that are constructed in three parts instead of two. A synthetic gemstone shares a natural stone’s physical, chemical and optical qualities, but it is created in a laboratory. You’ll see synthetic versions of nearly all popular gemstones and many versions have been available for many years. Older synthetics were fairly simple for gemstones to detect because they were often too perfect. Some modern synthetic gemstones look more natural and are harder to identify. Jewelry that includes quality synthetic gems can be just as beautiful as jewelry made with natural stones. Good synthetics aren´t always inexpensive, but should cost much less than natural stones of similar size and quality. Since synthetic gemstones have the same composition as their natural counterparts, they could technically be called genuine. It would be considered deceptive labeling if the stone’s origins are not disclosed. Unlike synthetic gemstones, simulated stones are in no way similar to the natural stone they are imitating. Their chemical composition is not the same nor are other gem qualities like refractive index. Can be spotted by tapping it on your teeth. Plastic will feel almost warm and not cold like glass or a gemstone. It will also make a dull quiet clink when gently tapped against your teeth. Imitations are cold as most of gemstones. The difference is that they quickly warm up when held and real gemstones will stay cold. Glass Artificial Lapis Lazuli has no gold specks although some top quality copies like Gilson Glass Lazuli does. Here the specks are too smooth and also too uniformly patterned to be real and the blue color is to even. Real Lapis Lazuli will leave a blueish mark on a rough surface. It also emits a foul odor when it’s cut in half. The sulfur in it smells with air contact. You have to take the same precautions with the fake lapis as you do with the original lapis. No cleaners as the stones are very porous and will soak up cleaners. No heating in ultrasonic or by torch. Synthetics made by Pierre Gilson of France. They are much softer than the original Lapis. It consists of grainy blue spinel colored by cobalt oxide and gold flakes to resemble pyrite. This material is also much harder which makes it easier to distinguish. Tiny chips of lapis and pyrite cemented together the same way reconstructed turquoise is made. A good quality of lesser quality lapis is dyed to improve the blue tone. Once the stone is dyed it is often oiled or waxed to improve luster. White howlite is dyed to create a lapis substitute. The dye tends to fade and there are also no pyrite inclusions. This stone is not Jade or Lapis. It is a dolomite marble dyed bright blue. This is another stone that the color fades and there are also no inclusions of pyrite. It is also called Swiss Lapis. It’s blue dyed jasper that is also lacking in pyrite inclusions. Sodalite is also actually more indigo than lapis and also lacks pyrite. Another way to tell the difference is a streak test. Lapis has a light blue streak while Sodalite has a white streak. Azurite usually forms crusts along side malachite. It is also much darker and also much softer than lapis. It is only 3.5-4 on the scale. It’s a darker Indigo than lapis and also lacks the pyrite inclusions. Why should anyone go to so much trouble to make Lapis Lazuli replicas? Ancient imitations of lapis were made because the real stone, required for various sacred purposes such as a passport to the underworld, was either unobtainable or too expensive. Although more recent fakes are also made with all the artistry available to the arch forger, to satisfy the demand of greedy, often gullible, collectors. Replicas of ancient jewels are made for people like me, who find an intrinsic beauty in the real object and can find it still in the copy. There is also a market for what I would call legitimate replicas. They are replicas of beautiful ancient objects made of lapis which most of the time are found in museums. The only way for a someone like me to enjoy one of these objects is to acquire an imitation. The imitations do not stay with the objects, but also with the pigments. The desire to find a substitute for lapis led to the development of substances of similar colors. This led to “Faience” and also to to the first synthetic pigment “Egyptian Blue”. In both cases copper sulfate was mixed with soda ash, then kiln-made or produced by boiling in a furnace. Much of the Egyptian artifacts were made with Egyptian Blue. Faking is not an exclusively Egyptian speciality; the forgers of elaborate antiquities (Mesopotamian lapis seals for instance) are just as likely today to be Chinese or European. Some people say that there is no reason to avoid fake gems, what you Do want to avoid is paying too much for misrepresented jewelry. In Idar-Oberstein there is a an imitation so sophisticated that is difficult to describe the substance as imitation. Its name is Galalith. It is formed by casein protein in cow´s milk.It was discovered in the 1890´s by Wilhelm Krische but was introduced to the jewel industry by Jacob Bengel in 1870. He soon realized there was a fortune to be made with galalith in the newly fashionable costume jewelry. When beautiful things exist, there will always be people trying to imitate it. The world is said to be full with fakes. Always be careful when you buy Lapis Lazuli. Try always to acquire it in reliable stores like my favorite Nammu store. In the beginning of this article you write genuine lapis has gold and silver spectacle and in the end you telling it should be pyrite spectacle in order to be genuine lapis? Which one is it??? Hello Ilona, thank you so much for your message. First, I must clarify that doesn’t have gold or silver. Regarding your question, it is both, since that gold and silver espectacle are due to Pyrite. Best wishes! Thank you, thank you, thank you! This is an excellent article and you mentioned a few things I didn’t know – which saved Me from making a purchase that was not genuine!!! You are welcome! We, at Nammu, believe only in the highest quality. Therefore, we do everything in our power to help you in that. Be attentive and noone will fool you. Good luck! Would you happen to know who sells rough lapis lazuli. I am glad to tell you that we (Nammu.com) ourselves sell raw lapis lazuli, but under request. If you are interested, please contact me at anastasia@nammu.com and we will discuss all the details. Thank you for your comment. Good luck! Hi can i post a picture on my Lapis lazuli IF you van see IF it is fake?